Two satellites of the European Galileo global navigation satellite system have successfully passed flight tests. Full satellite group will consist of 30 devices, and there are plans of its expansion after 2015. Apparently, the competition between the navigation systems of different countries is growing. The flight tests of the two spacecrafts launched in the framework of the deployment of the European Galileo navigation system were officially completed in the end of March. 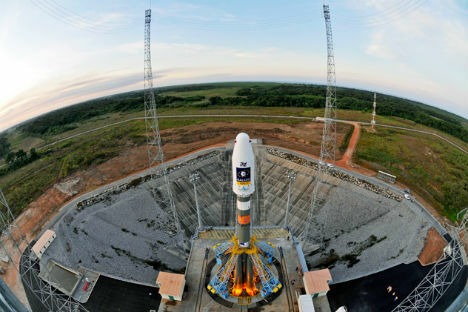 They were launched on October 21, 2011 from the Kourou cosmodrome in French Guiana by the Russian carrier rocket “Soyuz”. The satellites became the first working components of the system. In 2005 and 2008 navigation satellites were lofted into orbit, their task was to reserve radio frequencies intended for Galileo by the International Telecommunication Union, and to test the key technologies of the future group. Today, it is already the testing of the “workhorses” of the future system - the satellites and the ground segment. The first two have passed the tests by March. In the late summer of 2012 two more satellites should be lofted into orbit, and they will continue testing the system’s basic technologies. It is planned that by 2014, 14 satellites will be turning around the Earth, and they will be able to provide the users with navigation services. The ultimate goal is a group of 30 devices (27 working ones and 3 in reserve) on three circular medium-Earth-orbits at the altitude a bit more than 22 km. For comparison: the GPS and GLONASS groups currently include 31 satellite each. This number also includes satellites that are not working according to their designation, and the reserved ones. The accuracy of the Galileo system, as declared by the makers, amounts to about 1 meter; it is higher than the stated accuracy of the GPS system – that is 10 m. The Galileo system is deployed by the European Space Agency and is financed by the European Commission. The objective of the Galileo system, like any other navigation system “alternative” to the GPS (whether it is the already functioning Chinese regional BeiDou or the Russian GLONASS), is to reduce the dependence on American information. And if for China, that is aiming to deploy the full group of satellites for global coverage by 2020, such a system is only a natural step in the current confrontation, for Europe the deployment of its own system is important in order to ensure protection from possible failures. Unlike GLONASS and GPS, the European system was designed as a civil one, and it is not controlled by the national military departments. For millions of users it is not so important, from what satellite the signal comes to their receivers. However, it is hardly possible for Galileo, as well as for GLONASS, to violate the American monopoly on the market of navigation services, at least in the foreseeable future. It is not only about launches of satellites and perfecting the ground segment, but also about a huge number of receivers. For this reason, the Europeans make an emphasis on the fact, that Galileo will be compatible with theGPS and GLONASS. This means that the European devices work in several radio frequency ranges, and the designers of receivers can choose the most convenient ranges, in order to ensure the simultaneous processing of the signals from other navigation systems, which increases the accuracy of the positioning. In addition, the signals of the Galileo devices will be used in the satellite -based search and rescue system COSPAS-SARSAT. Many countries have already felt the desire not to "keep all the eggs in one basket". In addition to China and Russia, India and Japan are deploying their regional navigation systems. It seems that the competition in the global navigation is becoming more and more critical.